Air Warfare (AW) - Outfitted with SM-2s, or "Standard" Missiles, a 5in naval gun and two Close-In Weapons System (CIWS) 20mm gatling guns, RUSSELL can protect not just herself with a layered defense against aircraft and anti-ship missiles, but can defend the airspace over an area covering roughly 15,000 square miles. 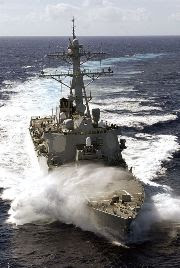 In addition, the ship’s manning includes one or more Air-Intercept Controllers who can defend the ship or strike group using fighter aircraft from the carrier or a shore base. Surface Warfare (SUW) – With her Harpoon anti-ship missiles, 5in gun and 25mm guns, the ship can once again defend against, or conduct an offensive strike against surface ships anywhere in the adjacent 11,000 square miles of ocean. Anti-Submarine Warfare (ASW) – Armed with anti-submarine rockets (ASROC) in the ship’s vertical launchers and Mk46 torpedoes in twin over-the-side launchers, RUSSELL can engage hostile submarines up to 15 miles away. In addition, the ship is outfitted to service and control a variety of anti-submarine aircraft that extend her ASW reach out to hundreds of miles from the ship. Strike Warfare (STW) – With a variety of Tomahawk Land Attack Missiles loaded in the vertical launchers, RUSSELL can attack land targets up to 1500 miles away. Ballistic Missile Defense (BMD) – With SM-3 missiles loaded, RUSSELL can defend against a range of ballistic missiles. Naval Surface Fire Support (NSFS) – Using her 5in gun, RUSSELL can provide sustained, rapid-fire gunnery support to ground forces up to 13 miles inland. Tying this all together is one exceptionally skilled crew and the Aegis Combat System - a no-kidding, “gee whiz” piece of technology that allows the ship to do just about all this, simultaneously. Come to think of it, RUSSELL might be more useful than a Swiss Army Knife. Try opening a bottle of wine and cutting some cheese simultaneously and you'll see what I mean. It was a cruiser, LAKE ERIE, that took the shot, but two destroyers, RUSSELL and DECATUR, were ready to shoot in the event LAKE ERIE had a problem. XO, I've always thought the Burke was not only the most capable destroyer ever built, but BIW also designed one that looked pretty darn sharp as well. I don't know why the Navy keeps spending money on DD(? ), when they already have the Burke...just build another 20 of them, everything will be just fine. Just one thing...I cannot understand for the life of me why the Flight II-A don't have CIWS..they don't even have RAM. Makes no sense. Nowadays, CIWS is a mulit-purpose gun with the addition of the low vis and thermal viewers. Figs have used them to convince go-fasts to slow down. Just imagine what a CIWS would do to the average Somilian pirate. I believe the philosophy on the flight IIAs was that the Evolved Sea Sparrow would fill the gap left by the CIWS, though I've heard mixed reviews on how that's working out.